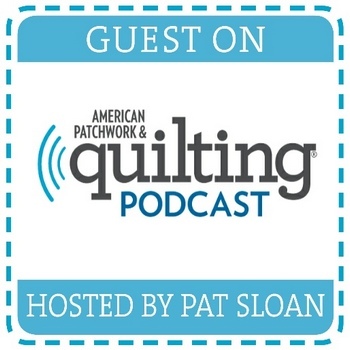 Ready for another installment of Round Robin? For those who have done these before, should round two be easier? I feel like each round comes with it's own set of worries! I've had an entire month to figure out the next move,and as always I wait until the last possible moment to get my round done. This is Libby's block. I was sure this was going to be a fun block to play around with. The multicolored dot fabric came with Libby's starting block. As soon as I saw it, I knew I had to somehow use it in my round. I like how Emily added the three flying geese in the first round. The colors pulled straight from the dots. Why...add more color of course! I pulled Kona Capri, Moda Lime (I think), Kona Storm and I'll use Kona Snow for the background of my contribution. These blocks are 2 1/2" unfinished and are the same size as Libby's center block size. It would work perfectly for my idea. The chevron block was the first block I made. I wanted to add more dark blue, but didn't want to overwhelm the rest of the block. This is a perfect combination of colors! Lime green is my favorite color and it's also one of the colors in the dot fabric. More colors, more blue, more dots! 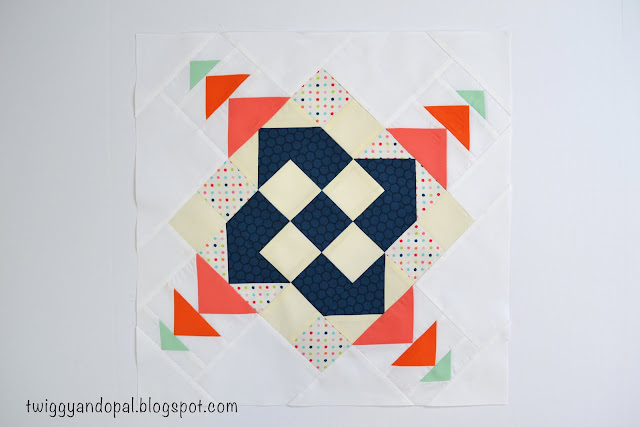 Half way through I was getting a festive party vibe and started calling it the 'Party Quilt'! Libby, I hope you like it! I'll be handing this off today and also picking up the next round! Round Three! It took me a long time to come up with my contribution to the Round Robin. It wasn’t easy! One of the things I am liking about participating is it does take you out of your comfort zone and it does push you. I’m very curious about my next round…and excited! We have two groups for the Round Robin and not everyone blogs. I’ll have to take pictures at our meeting and share! Great job Jayne ! Your round matches very well the whole and adds dynamism. I wanted to stay with the theme of the block. 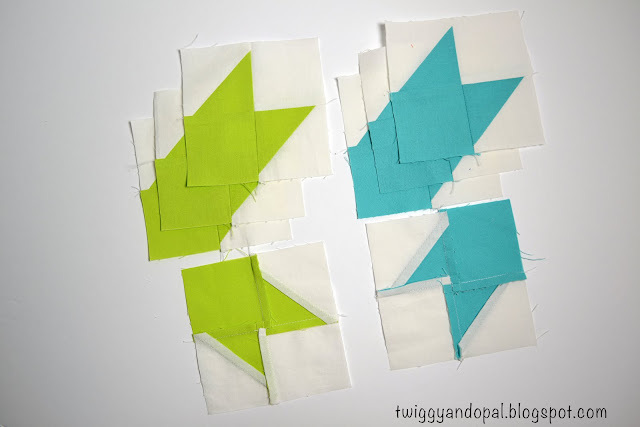 Squares and angles (flying geese). I’m pretty pleased with the results and can now start planning the next block that comes my way! Oh I like it, it makes the centre appear to float, complementing it without overpowering it. Perfect. I love the addition of the blue. Your round compliments the rest of the design without be overpowering. Well done. I found each round gets harder or should I say scarier...not wanting to add a round that doesn't work. I love your addition! It definitely looks like a party! You nailed it, head on!! OMG, when I saw what you added, I was stunned by how PERFECT it is! Congrats on a design well done. I think you did it justice! Very nice! I like it! I'm glad you went back to the off white background. I love the balance in this top so far--and how using the snow in your round makes the rest of the quilt float. Now I'm wondering: do you pass on the dot fabric to the next person, or one of the other fabrics? Fantastic addition and such a good balance of colors. I hope we can see how all these turn out when they are done! I think every round in a round robin is stressful, because it comes with it's own unique challenge as you try to make everything look cohesive. Jayne, you are rocking it. 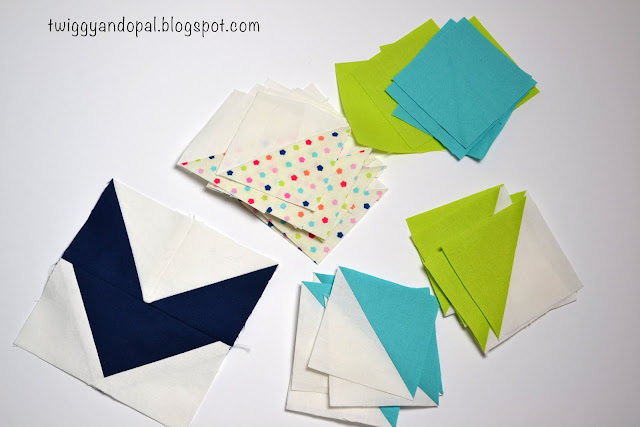 What you added in this round is perfect, the fabrics and the design. I cant' wait to see what you do with the next one you receive. 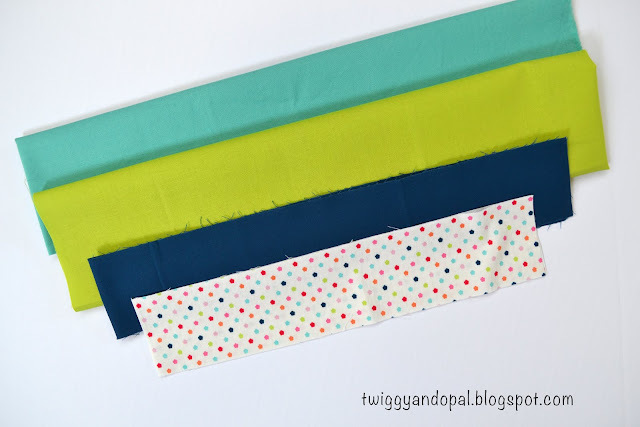 I love the solids that coordinate with the dot fabric! That is really looking great! Your addition enhanced the starting block, like you brought popsicles to the barbecue party. Sweet, cool and refreshing!!! It is definitely a party! 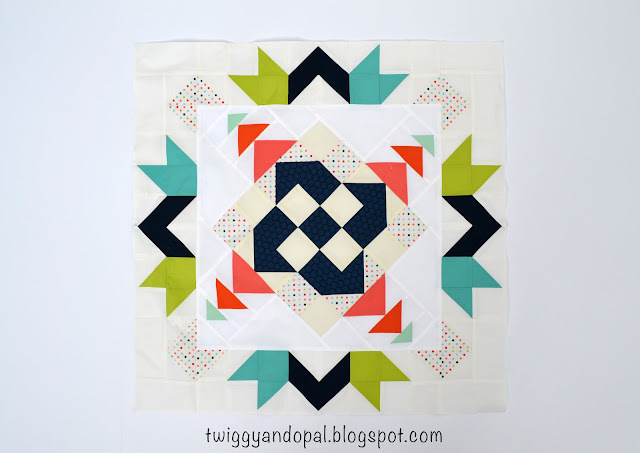 The colors are lively and the dark blue chevrons frame it and echo the center. Great design. Amazing Jayne. I love how you added another design layer. Great job! Oh my gosh, that's smashing! I think it's hard to pull of a strong round robin, but you guys are rocking it! I really like what you did and it looks more than 2 rounds already. I found the last round the hardest as I was framing the quilt to make it feel complete while adding to it at the same time! Secret Surprises Are The Best!